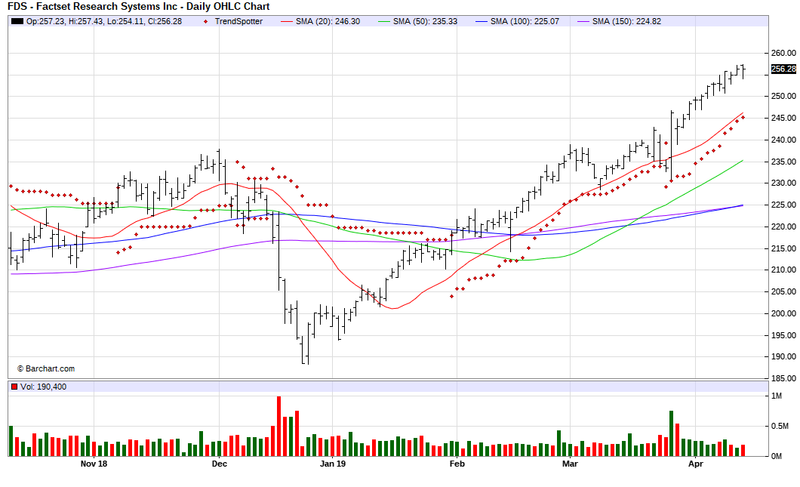 The Barchart Chart of the Day belongs to the financial information company FactSet Research Systems (FDS). I found the stock by sorting Barchart New All Time High list first by the most frequent number of new highs in the last month, then used the Flipchart feature to review the charts for consistent price appreciation. Since the Trend Spotter signaled a buy on 3/25 the stock gained 4.05%. FactSet Research Systems Inc. creates flexible, open data and software solutions for tens of thousands of investment professionals around the world, providing instant access to financial data and analytics that investors use to make crucial investment decisions. FactSet Research Systems bring together the world of big data, own in-house data, and own unique alternative data to help investment professionals see and seize opportunity sooner. FactSet helps the world's leading financial professionals stay ahead of global market trends, access extensive company and industry intelligence, and monitor performance with leading desktop analytics, mobile applications, and comprehensive data feeds. FactSet provides integrated financial information and analytical applications for the global investment community. The Company delivers insight and information to financial investment professionals through its analytics, service, content, and technology.